One of the highlights of the Sydney Taylor Book Award Committee session at the AJL Convention is the presentation of selected books we have read during the previous year. I was honored to “book talk” The Diary of Laura's Twin(Second Story Press) by Kathy Kacer. The story brings personal relevance to the history of the Holocaust by creating a connection between Laura, a Bat Mitzvah girl, and Sara, who grew up in the Warsaw Ghetto and was unable to celebrate her own Bat Mitzvah. Events in Laura’s life have new significance in light of Sara’s struggles. Through Sara’s diary, Laura learns about the events of the Warsaw Ghetto from the authentic voice of teenager whose experiences become real to her. The Diary of Laura's Twin is a contemporary story that melds history and current events in a meaningful way for young readers. I was thrilled for the opportunity to interview Kathy about The Diary of Laura's Twin. Tell me about the "Twinning Ceremonies" in The Diary of Laura's Twin. The idea for The Diary of Laura’s Twin actually came about because I wanted to write a book that documented for young readers the history of the Warsaw Ghetto uprising. I was struggling to come up with a novel premise for that book. And then, my publisher, Margie Wolfe, told me about having attended a Bat Mitzvah here in Toronto where she witnessed a “twinning ceremony.” The practice of having young people in the free world ‘twin’ their Bar- and Bat-Mitzvah celebrations with children who were unable to celebrate for themselves originated in the 1980's when many young North American, British and Israeli celebrants were ‘twinned’ with youngsters from among the Refusenik families in the Former Soviet Union. Today, in synagogues across North America young people are encouraged to share their Bar or Bat Mitzvah with a child of the Holocaust. My publisher thought I should write a book about a twinning ceremony and I thought I would combine that wonderful premise with my desire to write about the Warsaw Ghetto. And that’s how The Diary of Laura’s Twin came about. In the book there is a lot of information, including photos, about the Warsaw Ghetto. How much research was involved in writing the book? Research is a huge part of what I do in my writing in general. All of previous books have a strong historical component – either focusing on a particular event during the Holocaust, or a specific place, or a particular person. It always starts with the research. For The Diary of Laura’s Twin, I interviewed several survivors of the Warsaw Ghetto and their family members. I read extensively about the ghetto and the events that had taken place there. I found a fascinating history of the events of the uprising in a book called Brave and Desperate which I actually had to buy on ebay because it was out of print. I looked for photographs that would help illustrate the events of the Warsaw Ghetto for my readers. I never mind doing the research – I’m quite fascinated by it. My problem is knowing when to stop! Sometimes the research is more interesting and certainly easier than the writing. What was the most interesting thing you learned in the process of writing The Diary of Laura's Twin? I knew a bit about the twinning program before I began to write this book, but I did not know the amount of work that young people have to do to prepare for their own ceremonies. Here in Toronto, it is the Holocaust Centre that coordinates the program. It helps pair young people with survivors, outlines the kind of work that needs to be done between the two, and coordinates a “graduation” at the end of the year where the young people and the survivors with whom they have been twinned come together to honor one another. In The Diary of Laura’s Twin, Laura spends only a few weeks preparing for her twinning ceremony. In reality, young people can spend many months participating in this program. Are there real people who inspired Laura and Sara? There are no specific people who inspired Laura and Sara, though I always draw on a number of people I know and have met when I am developing my characters. Because I had interviewed a number of young people who had completed their own twinning ceremonies, I drew on aspects of each of them in creating Laura. I think she is a pretty typical young girl. She is living a normal life in present day, caught up in her many activities, and many friends, and somewhat reluctant to take on this project of having to find out about a girl who in her words, “lived a million years ago.” That’s how I tried to create her. I actually wrote Sara’s diary separate from the rest of the story and then put the two pieces together. I wrote the diary in long hand in a journal, as if I were inside Sara’s head, trying to understand how she might feel in the terrible circumstances in which she was living. I have that hand-written journal which I take with me when I speak to young people in schools and libraries. I have struggled for years with how to make the Holocaust a meaningful event in history for young readers. Given the fact that it happened so many years ago, it is difficult for young people today to make sense of anyone from that time period. 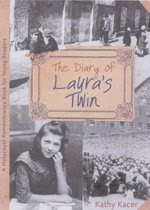 The Diary of Laura’s Twin allows readers to connect with a contemporary girl, and through her experience of finding and reading the diary of a girl in the Warsaw Ghetto, to then make the bridge to the events of the Holocaust. That is what is unique about this story. It is the co-existence of two important lives, one from today and one from the past who come together in the pages of this book. I always dreamed of being a writer. It took me a long time to get here. In fact, I started my work life as a psychologist, working with troubled teens and their families. I did that for twenty years, but always dreamed that one day I would write books for young readers. The thing that turned me on to writing was keeping a journal. I used to keep a journal when I was young. I still do today. Back then, I would fill my journals with stories about the people in my family – the interesting and amusing things they did, the adventures they got into, etc. I still have many of those journals today. Other than writing, I also love music, theatre, art, and especially painting. My walls are covered with the watercolors that I have done over the years. I love painting and wish I were better at it! Kathy, Thank you for sharing your writer’s journey. I have no doubt that The Diary Of Laura’s Twin will inspire readers for years to come! 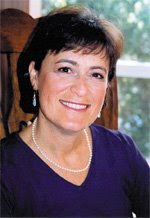 To learn more about Kathy and her work, please visit http://www.kathykacer.com/. The talented and inspirational Richard Michelson and Raul Colon accept the Sydney Taylor Book Award for their book, As Good as Anybody: Martin Luther King and Abraham Joshua Heschel's Amazing March Toward Freedom. 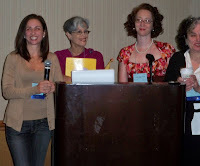 At the Association of Jewish Libraries Convention in Chicago, the Sydney Taylor Book Award Committee presented Adventures in Book Reviewing which included recommended books, “hot and not” selections, and previews of new books for the coming year. The audience was enthralled with presentations by this year’s Gold Medal winners, Richard Michelson and Raul Colon, the author and illustrator of AS GOOD AS ANYBODY, and Karen Hesse, author of BROOKLYN BRIDGE. After a delicious meal at a star-studded Authors Brunch and book signing event, I attended a session called How I learned about Amazing Jewish Books through Social Media, featuring Mark Blevis, host of Just One More Book, a podcast about children’s literature. He and Heidi Estrin, host of the Book of Life pod cast, introduced us to the various social networking options available for librarians to learn about new books and more, including blogs, Facebook, and Twitter. The Awards Banquet was the perfect event for our final evening together. The honorees including the Gold Medal winners, and the Silver Medal Winners - Richard Michelson, Arunka Siegel, and Anna Levine gave heartfelt, emotional speeches. It was an honor to share in the celebration. While visiting Chicago during the Association of Jewish Libraries Convention, a group of us journeyed to the magical land of Planet Esme. Esme Codell is an author and readiologist. The gingerbread building that houses Planet Esme welcomes visitors with Hansel and Gretel charm. A few flights up the and the fun begins! Esme’s walls are brimming with books, puppets, educational toys and more. 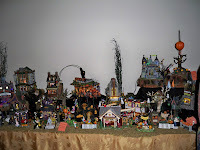 One room is devoted to miniature houses that sparkle with lights. It was heavenly to be surrounded by books, authors, and librarians while chatting about reading writing, and all things inspirational. The company was terrific and the pizza was sublime. Esme utilizes this incredible space for programs to educate parents and teachers. Thanks, Esme for an unforgettable experience! 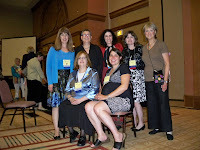 I am still basking in the glow of the wonderful Association of Jewish Libraries Convention. It was held in beautiful Chicago and the organizers did an incredible job. 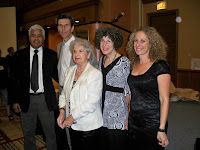 I had a chance to meet up with the other members of the Sydney Taylor book Award Committee. 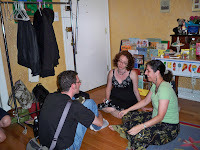 I’ll be writing about our session, Adventures in Book Reviewing, in another post. The first session I attended featured an impressive line-up of children’s authors, including Esme Codell shared her experiences as a teacher that inspired her book, VIVE LA PARIS. Ilene Cooper presented some of the stunning illustrations from THE GOLDEN RULE, a lovely book that represents many faiths. Brenda Ferber touched us with the real-life story that inspired JULIA’S KITCHEN, a thoughtful novel about love and loss. Esther Hershenhorn charmed the group with her personal experiences that led to the creation of CHICKEN SOUP BY HEART. It’s fascinating and inspirational to learn how stories come to life. 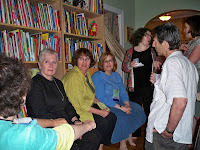 I have just returned from a most inspiring Association of Jewish Libraries Convention in beautiful Chicago. The Sydney Taylor Book Award Committee honored our winning authors and illustrators, and I was able to attend some amazing sessions about children's books, social media and more. I will be sharing more about experiences and photos with you all soon!